The Ennerdale Valley is located in the north western corner of the famous Lake District National Park. It is a secluded valley which offers visitors a tranquil experience and a sense of wildness which are increasingly rare in this busy urban world we live in. Within the valley there are opportunities to enjoy a range of activities or why not stay longer by booking into one of the accommodation providers located within the valley. The Gather is a new build community owned and managed Information centre, shop and cafe located in the village of Ennerdale Bridge just to the west of Wild Ennerdale. In addition to a cafe the building provides a community space for meetings events and activities and a local gym. The shop stocks visitor guides, walking and camping essentials for those tackling the Coast to Coast walk or just visiting for the day.The Gather Cafe provides delicious locally sourced and prepared food, light bites, wonderful coffee and other refreshments. A great meeting place before you visit Ennerdale or somewhere to finish the day off after a long walk, ride or just for a chat. For more information visit The Gather Cafe and Shop. 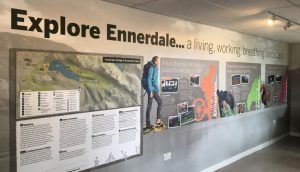 The Wild Ennerdale Partners have been supporting the idea from its origin, helping with developing the vision, early ideas and plans, planning and presentation, designing and funding internal display panels, providing tree and hedge plants and shelters. The site was a former Forestry England office which was reserved for the community 10 years ago and offered as a lease to the Community Hub in 2015 for £1/year which the Community Hub agreed to. Ennerdale Valley offers much to explore so why not stay overnight in the valley and experience the splendour of Pillar lit up by the setting sun or the sunrise over Great Gable casting shadows across the Drumlins of Blacksail. Within the valley and local area there is a range of accommodation available including two YHA's, a Bothy, a Field Centre, Pubs and Bed & Breakfast. Blacksail Youth Hostel - Situated at the eastern end of the valley Blacksail is a converted shepherds bothy offering two 4 and one 8 bedded rooms, self catering or breakfast, packed lunch and evening meal provided. Other facilities include Sitting/dining room, self-catering kitchen and shower. Limited shop. No access for cars. Ennerdale Youth Hostel - Situated half way up the valley Ennerdale YHA provides 4 star accommodation in three 4 and two 6 bedded rooms. self catering breakfast, picnic lunch and evening meal. Other facilities include common room, self-catering kitchen & drying room. Low Gillerthwaite Field Centre - Situated half way up the valley the Low Gillerthwaite Field Centre is run by its members for the benefit of all. The Centre offers dormitory accommodation and self catering for groups of up to 40 people - contact the Warden for details of availability and costs. Fox and Hounds Community Pub - located in Ennerdale Bridge this community owned and run pub provided great food sourced from local ingredients cooked by the pubs own chef and offers three ensite B&B rooms. Ennerdale Scout Camp - Recently refurbished and extend Ennerdale Scout camp offers a great location on the western shore of Ennerdale Water with good parking and is ideal for groups visiting Ennerdale.